David Kenny and Paul Schultz brought the smallest boat in our 2018 fleet, The Edge a Sunfast 3200, all the way to Osaka. 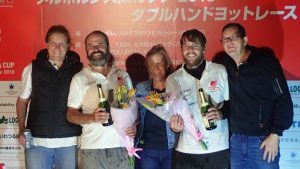 They had rigging issues some distance from the finish line but managed to sail the boat in a manner that saw them achieve their goal of finishing this marathon. Here’s owner skipper Dave’s answers to our questions. How did you feel as you crossed the line? 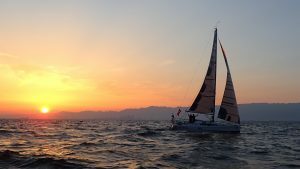 The sensation is fairly overwhelming and for me was a mix of elation at seeing family, deep seated relief at completing the voyage, a quiet sense of achievement and of course joy. There’s been preparation – then the race. Of those which was the hardest part for you? A difficult question, as both the preparation period including the delivery from Fremantle to Melbourne and the race itself had enormous challenges. On balance, I think it is the multitude of decisions that need to be made without the benefit of the race experience that are the most difficult, primarily due to the significant consequences they can have. Personnel selection being the most critical, followed by key equipment especially Comms and Nav and the sailing systems. Fortunately after much deliberation, I got the greater portion of these right but there is certainly some things I would do differently. Without doubt the welcome in Japan, which coupled with the overwhelming emotion of finishing is really something that needs to be experienced to be understood. I’m a positive person and so have tried to block most of this out but in all honesty it would be missing the weather window in the Solomon Sea by a few hours that ended up costing us a handful of days. Have you learnt anything about yourself by doing this event? The lessons and introspection take time to resonate and settle after strong life experiences, at first grab, the Melbourne Osaka Cup has reinforced my perseverance, strengthened a friendship and nurtured my sense of effort begets reward. If somebody else was thinking of doing the race, what advice would you give them? Call me… There is much to discuss! And now from The Edge co-skipper Paul Schultz. Mix of emotions for me. Glad to have arrived especially after the few preceding days of weather with big breezes and then no breeze! Coming into the bay and seeing Japan was just amazing after 6 weeks at sea but the realisation that the journey was coming to and end was a little sad. Seeing my wife and son on the finish boat along with all the well wishers when we docked was truly indescribable. You have this world where you are alone for so long and then you are surrounded by people and it took a while to register that we made it!! There’s been preparation – then the race. Of those which was the hardest part for you? For me the prep was the hardest bit. Based in Sydney and my skipper in Perth threw up some challenges especially when the boat was delivered to Melbourne! So much of this race is preparation to make sure you have all bases covered being at sea for so long. The sailing to be honest was probably the easy and enjoyable bit ( apart from the cyclone! ). I guess there were a few. 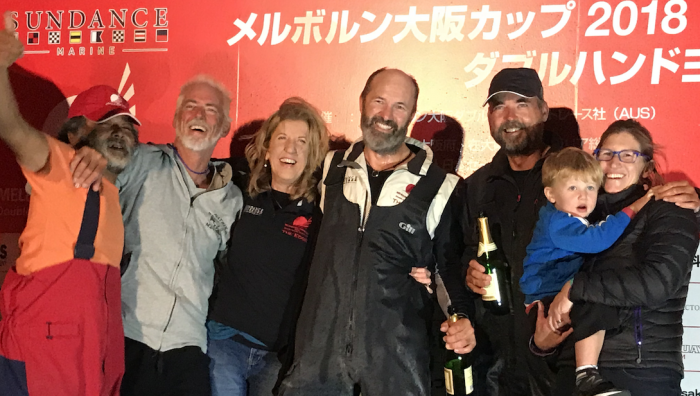 From just being alone in the middle of nowhere with a million stars above you, to seeing the finish line with loved ones waiting was just amazing and then there was a sense of achievement knowing you had just sailed 5500nm with a good mate and survived! Doldrums! Very hard to keep motivated some days when you literally drift a few miles while sweating out litres of fluid in very hot conditions. You just have to know you are going to have these days and accept it as best you can to get your head in the right frame of mind. Also, when our stays started parting company it was like, what next!! Yes I guess going into this it was going to be a big mental challenge spending so long on the water and apart from a few down days, felt pretty good. For me that was going to be the big test on how well I coped in this environment and happy to say I survived! The Osaka Cup is much more than a race, it is a journey on so many different levels. Preparation certainly is the key and finding a good sailing partner is paramount, not just for ability but you spend quite some time alone with one another so compatability is paramount. We had a blast and the welcome at the finish is just unbelievable. I guess people do this race for different reasons and for me this was something way out of my comfort zone but having done this now, cant wait for the next one! The comeraderie we have with the rest of the competitors is something you just don’t get unless you do this race and we have life long friends now. So if you are looking for something life changing, you must consider the Melbourne Osaka Cup ! Finally in this series of articles, we’re going to hear from Tom Crabb, co-skipper of Runaway. Tom had competed in the Melbourne Osaka Cup before and alongside skipper owner Daniel Turner had completely overhauled the Jon Sayer boat that had been purpose built for this race. Here’s Tom thoughts on our questions. It was a feeling of relief as we had got there safely and in good time. This was the primary goal of us both and it was a great feeling of satisfaction to help Dan achieve his goal. The preparation for these events is always the hardest thing, the constant barrage of ‘little things’ unseen by the questioning onlooker. The big jobs fall and quickly fade but the small ones tend to stay around your feet. When trekking in the jungle, the common fear is tigers but they can be heard a mile off and an exit strategy can be easily planned hence the greatest fear and the most discussed risk claims few victims. The mosquitos on the other hand…..! Without doubt, the discovery of the fact that sprouts are not suited to equatorial conditions, regardless of maintenance! This race reaffirmed for me that projects like this let you see the best in people, what they can achieve and places you in an environment of like minded people who have gained an appreciation for the simple things in life, which are actually of great importance. Also seeing their perception of necessity becoming more wholesome. Preparation, preparation and preparation. It just so happens there is a boat available where all the hard work has been done and she is still in perfect condition to take on the next challenge. She is for sale and comes with a black book of past owners, all of whom have had her best interests at heart though out their tenure. Roll on Runaway.